For legs, bikini and body… Indulge skin to leave it pampered and feeling fabulously smooth for up to four weeks with Brazilian Spa Clay Body Wax Strips. 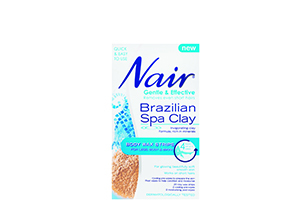 Brazilian Spa Clay Body Wax Strips contains a natural blend of key ingredients, including mineral rich clay, soothing mango butter and nourishing acai palm to leave skin glowing. Includes cooling pre-wipes to prepare skin and soothing post-wipes to help condition and moisturise. Top tip: remove any excess wax by washing away with lukewarm water. I won the whole package from BeautySouthAfrica and I then tested the products. They leave your skin smooth, radiant and hair-free. And you’ll love how long the smoothness lasts. It removes hair while you shower – in as little as 3 minutes. It’s water-resistant technology allows the Shower Power cream to stay on while you shower and dissolve when you’re ready to rinse it away. Its quick, convenient and it leaves your skin radiant and lasts days longer than shaving.